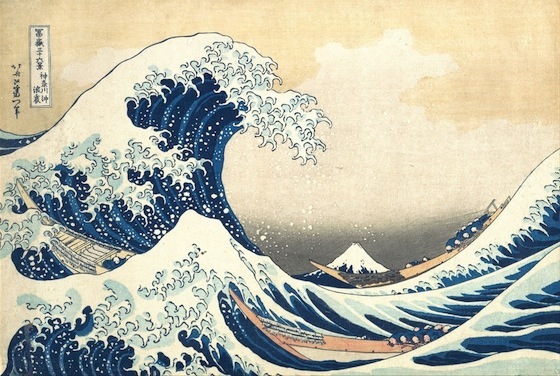 Katsushika Hokusai’s Under the Wave off Kanagawa, also called The Great Wave has became one of the most famous works of art in the world—and debatably the most iconic work of Japanese art. Initially, thousands of copies of this print were quickly produced and sold cheaply. Despite the fact that it was created at a time when Japanese trade was heavily restricted, Hokusai’s print displays the influence of Dutch art, and proved to be inspirational for many artists working in Europe later in the nineteenth century. Under the Wave off Kanagawa is part of a series of prints titled Thirty-six views of Mount Fuji, which Hokusai made between 1830 and 1833. It is a polychrome (multi-colored) woodblock print, made of ink and color on paper that is approximately 10 x 14 inches. All of the images in the series feature a glimpse of the mountain, but as you can see from this example, Mount Fuji does not always dominate the frame. Instead, here, the foreground is filled with a massive cresting wave. The threatening wave is pictured just moments before crashing down on to three fishing boats below. Under the Wave off Kanagawa is full of visual play. The mountain, made tiny by the use of perspective, appears as if it too will be swallowed up by the wave. 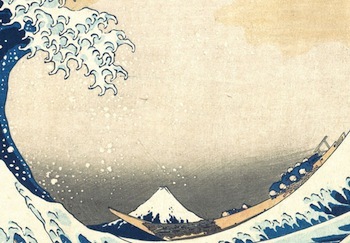 Hokusai’s optical play can also be lighthearted, and the spray from top of the crashing wave looks like snow falling on the mountain. Hokusai has arranged the composition to frame Mount Fuji. The curves of the wave and hull of one boat dip down just low enough to allow the base of Mount Fuji to be visible, and the white top of the great wave creates a diagonal line that leads the viewers eye directly to the peak of the mountain top. Across the thirty-six prints that constitute this series, Hokusai varies his representation of the mountain. In other prints the mountain fills the composition, or is reduced to a small detail in the background of bustling city life. Hokusai was born in 1760 in Edo (now Tokyo), Japan. During the artist’s lifetime he went by many different names; he began calling himself Hokusai in 1797. Hokusai discovered Western prints that came to Japan by way of Dutch trade. From the Dutch artwork Hokusai became interested in linear perspective. Subsequently, Hokusai created a Japanese variant of linear perspective. The influence of Dutch art can also be seen in the use of a low horizon line and the distinctive European color, Prussian blue. Hokusai was interested in oblique angles, contrasts of near and far, and contrasts of manmade and the natural. These can be seen in Under the Wave off Kanagawa through the juxtaposition of the large wave in the foreground which dwarfs the small mountain in the distance, as well as the inclusion of the men and boats amidst the powerful waves. Mount Fuji is the highest mountain in Japan and has long been considered sacred. Hokusai is often described as having a personal fascination with the mountain, which sparked his interest in making this series. However, he was also responding to a boom in domestic travel and the corresponding market for images of Mount Fuji. Japanese woodblock prints were often purchased as souvenirs. The original audience for Hokusai’s prints was ordinary townspeople who were followers of the “Fuji cult” and made pilgrimages to climb the mountain, or tourists visiting the new capital city. 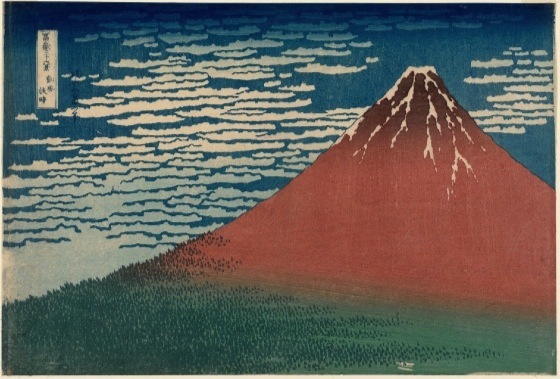 Although the skyscrapers in Tokyo obscure the view of Mount Fuji today, for Hokusai’s audience the peak of the mountain would have been visible across the city. Ukiyo-e is the name for Japanese woodblock prints made during the Edo Period. Ukiyo-e, which originated as a Buddhist term, means “floating world” and refers to the impermanence of the world. The earliest prints were made in only black and white, but later, as is evident from Hokusai’s work, additional colors were added. A separate block of wood was used for each color. Each print is made with a final overlay of black line, which helps to break up the flat colors. Ukiyo-e prints are recognizable for their emphasis on line and pure, bright color, as well as their ability to distill form down to the minimum. Hokusai moved away from the tradition of making images of courtesans and actors, which was the customary subject of ukiyo-e prints. Instead, his work focused on the daily life of Japanese people from a variety of social levels. Such as the quotidian scene of fishermen battling the sea off the coast of Mount Fuji that we see in The Great Wave. This change of subject matter was a breakthrough in both ukiyo-e prints and in Hokusai’s career. Beginning in 1640, Japan was largely closed off to the world and only limited interaction with China and Holland was allowed. This changed in the 1850s, when trade was forced open by American naval commodore, Matthew C. Perry. After this, there was a flood of Japanese visual culture into the West. At the 1867 International Exposition in Paris, Hokusai’s work was on view at the Japanese pavilion. This was the first introduction of Japanese culture to mass audiences in the West, and a craze for collecting art called Japonisme ensued. Additionally, Impressionist artists in Paris, such as Claude Monet, were great fans of Japanese prints. The flattening of space, an interest in atmospheric conditions, and the impermanence of modern city life—all visible in Hokusai’s prints—both reaffirmed their own artistic interests and inspired many future works of art. Cite this page as: Leila Anne Harris, "Hokusai, Under the Wave off Kanagawa (The Great Wave)," in Smarthistory, August 9, 2015, accessed April 21, 2019, https://smarthistory.org/hokusai-under-the-wave-off-kanagawa-the-great-wave/.